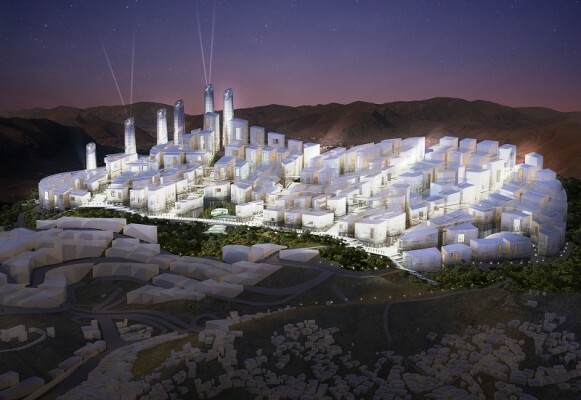 Germany-based White Sky Group | Gewers & Pudewill signed a contract with Riyadh-based AlFayadh Consultants for the development and master planning of a 91ha scheme in Makkah, Saudi Arabia. The partnership beat off strong competition from Foster + Partners to land the mixed-use development, awarded by Jadwa Investment in Riyadh. It will contain middle and high-rise buildings and house an estimated 160,000 inhabitants. The project integrates various building types including hotels, residential, malls, technical and medical infrastructure, mixed with parks and open spaces as well as spacious prayer areas. After winning the competition phase and first prize, the project underwent feasibility studies and due diligence to confirm market performance. White Sky Group | Gewers & Pudewill GmbH was founded as a partnership and shareholding company specifically for the Makkah project.